Ryan Seddon: @ryanseddon aka the CSS Ninja develops Modernizr, writes polyfills, and explores the edge of DOM APIs. His recent exploration of source maps lays a lot of groundwork for future web debugging potentials. Hans Christian Renl: @drublic started contributing extensively to HTML5 Boilerplate and has been actively engaged in other projects we have worked on. He also maintains a blog where he shares his learning experiences and explorations of advanced CSS features. Jason Kiss: @jkiss’s notes on accessibility are like a breath of fresh air into the dense field of accessibility. He tests in as many accessibility technology tools as available and bases his opinions on findings from his research. His articles are extremely valuable to web developers who have long had to base how to do the right thing on superstition and fact-free opinions. Eric Dahlström: @erikdahlstrom is not just the editor of SVG specs, but also helps out often in mailing lists and Stack Overflow with SVG questions. Not only that, he is an unbelievably skilled (obviously!) at hand-coding lightweight SVG, and maintains a repository of SVG images that are worthy of learning from on how to do SVG right. Tim Branyen: @tbranyen created Backbone Boilerplate and Backbone Layout Manager to make it easy for everyone to get started with Backbone. 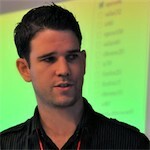 He also writes extensively on his blog on dealing with problems of creating web apps. Roman Cortes: @romancortes is one of few who can explore some interesting innovative uses of CSS. His explanation of a 1kb chrismas tree is a whirlwind of frontend knowledge. Peter Beverloo: @beverloo started off a series on his blog documenting what’s new in WebKit/Chromium. He’s since been hired by Google and works on Chrome for Android. His work in distributing edge browser development news has helped thousands of people track the quickly expanding web platform. Erik J Moller: @erikjmoller is to WebGL what @dahlstrom is to SVG. His skill and ability to hand-code webGL is unparalleled. He created a 10-part video on learning webGL (webGL 101) that is archived on youtube not to mention is the main contributor to EmberWind an open source webGL game that is highly performant. Irene Ros: @ireneros dabbles in info-viz tools and has published several of them on GitHub. She is active in contributing back to open-source projects and also maintaining a few of them including Miso Project and underscore.nest. Mike Taylor: @miketaylr is developer relations extraordinare for Opera. He has been a behind-the-scenes force getting a lot of cross-browser compatibility and feature detection complete and distributed. Zoe Mickley Gillenwater: @zomigi wrote an excellent book about CSS3 and publishes informative articles on CSS on her website that are a good resource for anyone who is working with CSS3. Zoltan Hawryluk: @zoltandulac painstakingly researches making CSS3 features backwards-compatible with IE, in addition to blogging about several discoveries in the process. There are clearly far more people that deserve to have their praises sung. Plenty of people whose names you already know, but also folks like @ZachLeat, @Alex_Gibson, @mbostock, @RobFlaherty, @Raynos2, @bricss and more. We are grateful towards everyone who has helped us along the way to shape the web to be as friendly as possible to web developers, by driving the work on frameworks, libraries, articles and outreach. They do it on their own time, because of their love of and fascination with the web. All of them are well worth your time to pay attention to and follow and hear their opinions of the web. We’ve left out some of the bigger names in this list, so hopefully we can all discover someone new who covers a relevant field extremely well. This is our list, but feel free to leave a comment with anyone you’d put on yours. Or better yet, blog it yourself and link up your list here.